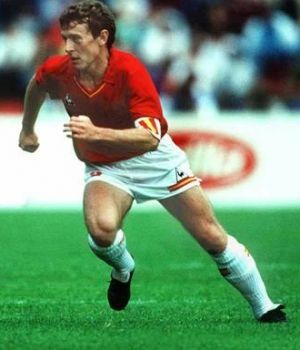 Butragueño scored a goal in his international debut for Spain against Wales in October 1984, just months after Spain finished second in the European Championship. He was a regular in the team by the 1986 World Cup in Mexico as Spain looked like serious title contenders. They progressed rather easily from their first round group and met Denmark in the second round, a replay of the semifinal at Euro 84. Butragueño experienced one of his finest days as soccer player as he became the first man since Eusebio in 1966 to score four goals in a World Cup match as Spain ran out 5-1 winners against one of the tournament favorites. A defeat to Belgium on penalties in the following round ended Spain’s dream of a first World Cup title. Emilio failed to show his real class in Italy four years later and did not manage to score a single goal in the four games he played as Spain reached the second round. He was then the new team captain and took more responsibility in the defensive work and let Julio Salinas do the running up front. It was to be the last tournament he played for Spain. At club level, Butragueño had much more success winning five straight league championships with Real Madrid during the second half of the eighties. He left Real in 1995 for a career in Mexican soccer and retired a couple of years later.